For many years the Darien Gap had been considered one of the most dangerous areas on earth. When we were preparing our expedition, some experts were estimating that for anyone attempting to cross this overland route from Panama to Colombia, the chances of survival were less than 50 percent. Others said it was nothing short of suicidal. Our path followed a little-known Caribbean-to-Pacific trail across the top edge of the Darien. 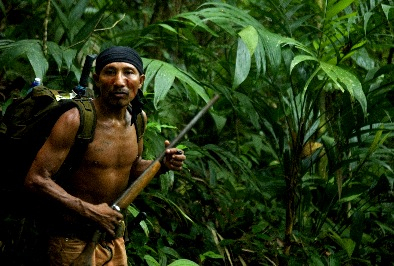 Apart from the “everyday” threats from guerrillas, bandits and cocaine traffickers (and the indigenous population who – though normally hospitable and friendly – are all-too-often intimidated into collaborating with them), the local people seem to have populated this area with countless bizarre otherworldly dangers. Before entering the remote mountain slopes at the edge of Kuna territory Teddy Cooper insisted on painting all our faces with bright red achote juice. “Now the spirits will know that we come in peace,” he explained, “and that we’re here to treat the jungle with respect.” Teddy made a point always to ask permission of the jai spirits before hunting or even before picking plants. Many of the jungle tribes of the Darien also paint their babies entirely blue when they are about three weeks old. The blue stain of the jagua plant lasts a few weeks and is said to protect the baby from curses. It probably also provides some protection against insect bites. The people of the Embera and Wounaan tribes also use this jagua body-paint on ceremonial occasions and girls are entirely painted again at puberty and before marriage. For some reason it seems that the indigenous people of Darien have seen fit to populate what is already said to be the most dangerous jungle in the world with all sorts of supernatural beasts. They talk of the madre de agua who lives under whirlpools where she can drown passers-by, and of the arripada, a monster with one hand shaped like a hook for tearing the heart out of its victims. The most bizarre is the old witch known as tuluvieja whose sieve-like face is so ugly that she wears her long hair over her face in shame. She also has a single sagging, distended breast that hangs down in front of her. The local people say that she steals children and, when their fathers come to rescue them, she sprays the rocks with slippery milk from this unsightly appendage to make them impassable. Heading off on an adventure? Be sure to have everything you need – here’s your definitive travel kit-list.